Image: Alexandra Grant and Hélène Cixous, Paris, December 2012. Photos by Kevin Kane. Forêt Intérieure/Interior Forest was a dual-venue exhibition and publication by Los Angeles- based artist Alexandra Grant in collaboration with Paris-based writer Hélène Cixous. The multi-dimensional project, which included a residency component and contributions by both Los Angeles-based and Paris-based artists, was presented from April 15 to June 28, 2013 at the18th Street Arts Center in Santa Monica, CA and from August 24 to October 27, 2013 at Mains d’Oeuvres in Saint-Ouen, France. Pilar Tompkins Rivas, formerly the Curator and Director of Residency Programs at 18th Street Arts Center, Isabelle Le Normand, Curator at Large, and Ann Stouvenel, Curator of Visual Arts at Mains d’Oeuvres, were co-organizers of this project. 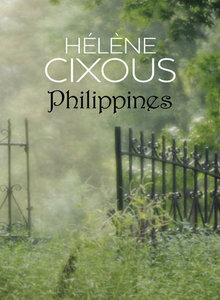 Several years ago, the iconic French author, poet, playwright and philosopher Hélène Cixous gave Grant one of her books, “Philippines”, as a source for imagery and entreated the artist to make work about the concepts present in the text. “Philippines” is based around the story of Peter Ibbetson, a novel by Georges du Maurier, where two childhood friends are separated by class and country and reunite as adults in their shared dream-life. The themes of “Philippines” are often paired: dreaming and reality; telepathy and empathy; the “perfect other;” the shape of two nuts found in a single mandorla or almond (known as a Philippine); and relationships between north and south, man and woman, colony and colonizer, and adult and child. Grant’s response to Cixous and “Philippines” was the project Forêt Intérieure/Interior Forest, centering on the image of a forest as a representation of both the shared imagination and a place for congregation and collaboration. In each iteration, Forêt Intérieure/Interior Forest included a large-scale installation of a forest and a collaborative drawing that invited community participation. Trees in the interior forest were made of both text and textiles. The drawing, functioning both as an illustration and a text scroll, represented a visual narrative of “Philippines”. Created by Grant in conjunction with other artists and members of the public, the process of working jointly invited contemplation of Cixous’s concepts and developed a platform for shared imagining. The two iterations of the installation in both Santa Monica and Saint Ouen functioned as mirror images, or twin versions of the same whole. Forêt Intérieure/Interior Forest extended Grant’s studio practice into the arena of public engagement. Grant created two ways for artists to participate in her project. First, several artists were invited to produce “Visiting Trees” (Arbres d’Ailleurs) inside the Forêt Intérieure/Interior Forest installation in either city. Second, Grant established “Drawing Residencies” as part of the process of creating the large-scale drawing. Artists were invited to lead the public, including students, guests and passersby, to help realize the larger work. Luca Acheson, Basim Al Ansar, Lita Albuquerque, Marya Alford, Shiva Aliabadi, Lauren Andino, Janine Arbelaez, Carmen Argote, Shagha Ariannia, Myke Armstrong, Joshua Aster, Chad Attoe, Daniyar Aynit, Adriana Baltazar, Raul Baltazar, Diana Barash, Alizée Bariatti, Michael W. Barnard, Tyler Barnett, Jonny Barrios, Andrew Beath, Christine Beebe, Nancy Berman, Amy Bourne, Clémence Bourquin, Leonardo Bravo, Hallie Breene, Tyler Bremer, Gianpaolo Bucci, Kristin Calabrese, Mark Carrie, Nereida Castro, Nina Castro, York Chang, Penny Chen, Allison Cheung, JoAnne Colonna, Steven Conklin, Julia Countryman, Kyle Cowser, Zoe Crosher, Colomba Cruz, Caryl Davis, Tom Dean, Wanda Decca, Jake Dotson, Dana Duff, Emma Gray, Danny Escalante, Lauren Evanow, Joy Feasley, Kyla Fenning, Rachel Finkelstein, Charity Gaye Finnestad, Merle Fishman, Jessica Fleischmann, Luis Flores, Jen Frank, Debra Frascarelli, Eugenie Fremiot, Jonathan Furmanski, Nery Gabriel Lemus, Elizabeth Gallardo, Kit Galloway, Angel Garcia, Frances Garriston, Alyse Gellis, Yvette Gellis, Christiane Georgi, Nimrod Gershoni, Chiara Giovando, Jane Glassman, Amanda Goch, Meghan Gordon, Adeline Gourdoux, Karen Graff, Alexandra Grant, Audra Graziano, Mark Steven Greenfield, Shona Gupta, Sarah Hagmann, Leila Hamidi, Simon Hanna, J. Scott Hardman, Nicole Heetland, Mary Beth Heffernan, Art Helterbran, Katie Herzog, Annette Heully, Asuka Hisa, Vincent Ho, Rosemary Hochschild, Anna Maria Hoffman, Catherine Holliss, Violet Hopkins, Jeanette Horn, Cathy Hsiao, Salomon Huerta, Aska Irie, Ichiro Irie, Gillian Jacobs, Hillary Jacobs, Mason Jar, Alexandre Jousse, River Jukes-Hudson, Tricia Jurovic, Ann Kaneko, Ceiba Kaneko, Fitzhugh Karol, Robert Kondrk, Talbot Kondrk, Clara Kornelis, Arzu Arda Kosar, Simone Kussatz, Sam Laughlin, Janet Le, Heather Lee, Adee Levy, Doris Levy, Jonathaan Levy, Kris Lewis, Mark Licari, Galia Linn, Tina Linville, Dan Lloyd, Joanne Lloyd, Joe Lloyd, Lisa Lo Russo, Anthony Lopez, Richard Louderback, Benjamin Love, Monica Magdaleno, Elana Mann, Gavin Marshall, Jeremy Mascia, Anna Mayer, Yassi Mazandi, David McDonald, Annelie McKenzie, Elise McMillen, Kathleen Melian, Fred Mezzo, John Mills, Jessica Minckley, Hayley Miner, Melissa Mooney, Anthony Morales, Toyin Moses, Kathrine Narducci, Robert Nashak, Jess Newman, Karyl Newman, Larissa Nickel, Cody Norris, Madeleine Nyhagen, Heather O’Brien, John David O’Brien, Mary Eileen O’Donnell, Geoffrey Olson, Stas Orlaski, Ruby Osorio, Hayley Owen, Marcus Owens, Kiran Paesel, Fabia Panjarian, Laura Pardini (FR), Laura Pardini (USA), Marcus Perez, Ben Peyser, Hannah Phillips, Bruce Polichar, Mary Anna Pomonis, Lauralee Pope, Nancy Popp, Gala Porras- Kim, Ashley Pottenger, Cortney Prudente, Rebeca Puga, Ho Yan Pun, Jessica Queller, Sophie Queller, Joy Rath, Judith Ravenswood, Juliet Ravenswood, Linda Ravenswood, Ingrid Reeve, Cindy Rehm, Friederike Reveman, Joakin Reveman, Steve Roden, Jeanne Roderick, Rachelle Rojany, Tatiana Rose, Shelley Rugg Thorp, Trinidad Ruiz, Olivia Sanchez Brown, Whitney Sander, Wyeth Sander, Kim Schoenstadt, Leander Schwazer, Roberto Sheinberg, Becca Shewmake, Fran Siegel, Susan Silton, San Sit, Samantha Snowden, Justin Stadel, Mark Storhaug, Keng Sumsiripong, Valerie Sun, Franz Szymanski, Andrea Tennis, Elaine Teso, Martin Teso, Jolyn Tyahyadi Tjhia, Pilar Tompkins Rivas, Scotty Tran, Stephen Truax, Shirley Tse, Chih Chen Tseng, Beatriz Valls, Florian Viel, Cheryl Walker, Lolly Ward, Robyn Weinstein, Maria Welch, Leora Wien, Jan Williamson, Robin Wolf, Mel Woods, Janet Worcester, Peter Wu, Samantha Wu, Suzy Yaako, Meital Yaniv, Carolyn Yuen, Goldie Zaldivar, Jody Zellen, and Alexis Zoto. At Mains d’Oeuvres, hosts for the drawing sessions included Fabien Vehlmann, Daniel Oglander, Meital Yaniv, Florian Viel, Laura Pardini, Guillaume Legrand, Laetitia Favret, Christiane Georgi, Nathalie Harvey, Maelle Schneider, Antoine Lombart, Antoine Aubert, Valentin Lerges, Stefan Delvoye, Kate McCrickard, and Zoe Crosher. Over 125 artists helped create the “L’Autre Parfait,” at Mains d’Oeuvres which illustrated “Philippines”: Lisa Ageev-Lemaitre, Jerome Alinot, Eva Belgherbi, Andreï Belle, Jean-Baptiste Belliard, B. Graland, Ben Schpock, Damien Beslot, Sarah Boardman, Lea Borie, Brinda Buljore, Laure Castelli, Maeva Castier, Yan Ceh, Odie Chaavkaa, Amelie Chasseriaux, Juliet Corentissot, Alexandra Couzin Prada, Gilles Davanture, Floriane Deletre, Stefan Delvoye, Manon Desplechin, Hadda Djeribi, Aykiz Dogan, Andrew Edwards, Fabien Efgh, Emline Efgh,Kevin Emmanuel, Mathieu Fantoni, Laetitia Favret, Pauline Foussat, Christiane Georgi, Florencia Giusti, Philippe Gobin, Sophie Goullieux, Marcia Grant, Laetitia Grossemy, Marina Gusina, Bruno Hadjadj, Nathalie Harvey, Norida Ho, Laurence Hochin, Catalina Insignares, Maurette Isabel, Nathiva Lago, Jeanne Lassus, Estelle Lassus, Corentin Lecourt, Guillaume Legrand, Magali Lemée, Antoine LeRoux, Antoine Liebaert, Philippe Malapert, Laetitia Masson, Kate McCrickard, Marco Meneghini, Marijke Michielin, Roxane Morin, Noe Murphy, Daniel Oglander, Anne Papalia, Clémence Perrin, Mario Picardo, Cedric Pierre, Gerald Pioch, Claire Poisson, Julie Portier, Renan Puglisi, Guillaume Regnaux, Jenna Renouard, Tinka Rodriguez, Marie Roy, Mohamed Sabri, Eleonore Saintagnan, Nathalie Sama, Virginie Saury, Miriam Schulte, Eva Sidlin, Mikhail Sidlin, Anna Six, Ann Stouvenel, Hawa Sylla, Myriam Sylla, Youssouf Sylla, Valentin Toqué, Dounia Trabelsi, Caroline Vandenberghe, Antoine Vanderlick, Fabien Vehlmann, Alix Veilhan, Laure Vigna, Lucie Weber, Chao Yang. Published in 2016 by 18th Street Arts Center and designed by Jessica Fleischmann, the catalog documents the Forêt Intérieure/Interior Forest, a multi-faceted participatory project organized by Los Angeles-based artist Alexandra Grant in collaboration with the French writer and philosopher Hélène Cixous. Forêt Intérieure/Interior Forest were two exhibitions that took place in 2013 at 18th Street Arts Center in Santa Monica, CA and Mains d’Œuvres in Saint-Ouen, France. Structured as a residency and an exhibition at each venue, Forêt Intérieure/Interior Forest extended Grant’s studio practice into the arena of public engagement. The exhibitions included public drawing sessions to translate Cixous’s novel “Phillipines” into a large-scale work in each gallery via reading groups, artist collaborations, lectures and performances. The twin exhibitions were co-curated by Pilar Tompkins Rivas, Isabelle Le Normand, and Ann Stouvenel. The Forêt Intérieure/Interior Forest catalog includes essays by Alexandra Grant, Robert Nashak, Pilar Tompkins Rivas, a public conversation by Alexandra Grant and Hélène Cixous, and a letter from Hélène Cixous. Michael Barnard’s film “Interior Forest by Alexandra Grant” is a 13 minute film that documents the creation of this unusual communal artwork over the period of several months at the 18th Street Arts Center Main Gallery in 2013. The film includes an in-depth interview with Alexandra Grant, the creator and lead artist of the project. It also includes interviews with several of the participating artists, including Steve Roden, Renee Petropoulos, Channing Hansen, and Annelie KcKenzie/Tina Linville.